Awesome concept, great composition, well photographed. good luck in the challenge! B/W works well. I like this composition with the jacks, too. Seems to lose focus as it goes back. Still, nice work! I love these things. Hard to find around here, though. Excellent use of b/w to tie the whole theme together. nice shot. im too young to recognize this type of candy. and its been a long time since i played jacks, but remeber them. good shot. Nice use of black and white. Good to see someone enter something with the old time candies. Jacks and ball add a lot to the "story" here, too. 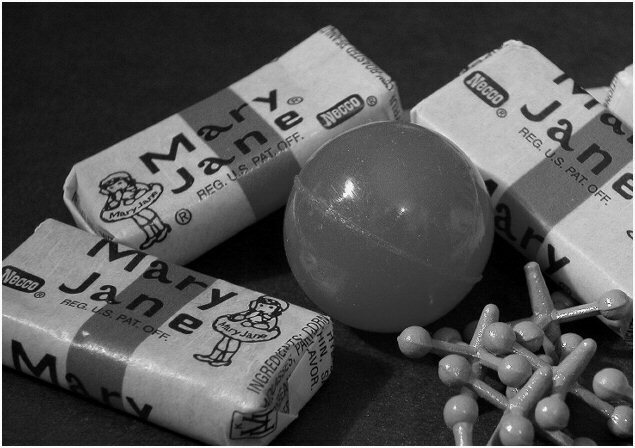 I loved and love MaryJanes.........yum. Great composition and focus. Nice going. I think this is the most original photograph of all. I love your combination of old time goodies. I think the choice of b&w is a big plus too. I give it a nine! It could be just a tiny bit more in focus. The use of B&W, the old-fashioned brand (who doesn't remember Necco?) and the toys work well together. You've achieved the goal of drawing on our memories.. Proudly hosted by Sargasso Networks. Current Server Time: 04/23/2019 07:55:13 AM EDT.